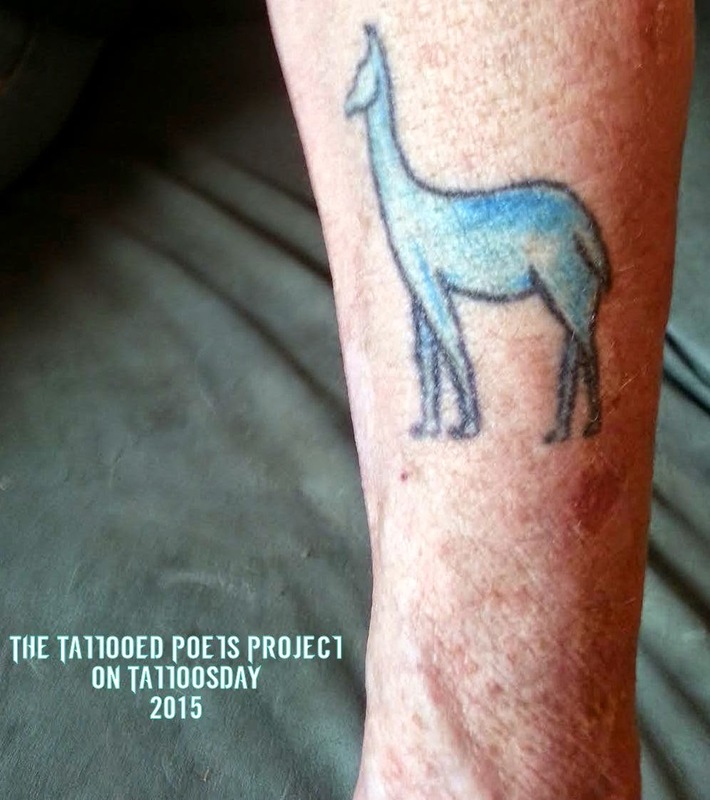 "I gave myself the gift of this tattoo of before starting chemotherapy after a lumpectomy; I always thought if I ever had a small press I would have a 'Blue Llama' imprint. This piece [below] - perhaps not quite a poem - has nothing in common with the image on my forearm except for the title. Yet! As I thought about it I realize the 3 stanzas all have to do with the perceptions of an older person. And I would not have become an older person without all my treatments and some damn (knock on wood) good luck. I would never have known the power and smarts of crows; the two poets, had they lived, would have been my contemporaries instead of my babies, and I would never have experienced the bewildering new textures of a post-menopausal face. So! the tattoo is my talisman." She credits an artist named Reba Rasbury DeViolet for this work. Three crows are eating a rabbit. they lift their beaks, almost sniffing. These crows darkly shine above the tufts of red and grey. Come evening hundreds will roost by the lake. from the Sanskrit for gleaming. So few things make sense, but that does. For one, death was a dressing gown. Silk. Death was the other’s muddy boots. since they were boys. They never shut up. One was stark, the other gorgeous. Two poets, my first muses, my babies. a thicket of clouds and mice. They have all the answers, those little ones. Pamela Stewart is the author of several chapbooks and 6 full-length volumes of poems, the latest being Ghost Farm (Pleasure Boat Studio, 2010). She's enjoyed a Guggenheim, a Hawthornden Fellowship and grants from the Massachusetts Cultural Council and the Elizabeth George Foundation. She lives on a farm in western Massachusetts and keep plugging away at that poetry stuff. Thanks to Pamela for sharing her work with us here on the Tattooed Poets Project on Tattoosday!